Hi, Everyone. I'm giving away one copy of one of my best selling items. 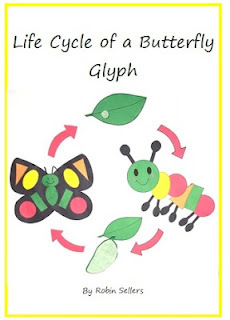 My Life Cycle of a Butterfly Glyph includes my Colorful Shapes Caterpillar Glyph and my Colorful Shapes Butterfly Glyph. I've added extra patterns to complete the life cycle. This set is a wonderful way to teach across the curriculum. Your students will learn about shapes, symmetry, graphing, science, writing, and more. Click the image below to enter. Robin @ Sweet Tea ClassroomPlease follow by e-mail to learn about more giveaways.